A well-orchestrated installation piece is often successful when the artist is able to actively engage the viewer as participant. Two of the exhibitions at Vox Populi this spring — Stephanie Bursese’s to skip, to gloss and Timothy Belknap’s Chum — create a dialogue between seemingly discordant ideas that pertain to consciousness and physicality. Each installation urges the viewer’s attention inward, to focus on the consequences and awareness of action, creating a controlled environment for us to consider the complex origins of our own principles. It feels important, especially in this time of highly contrasting and strongly held opinions, to have the ability to examine where our convictions come from and why we hold them. 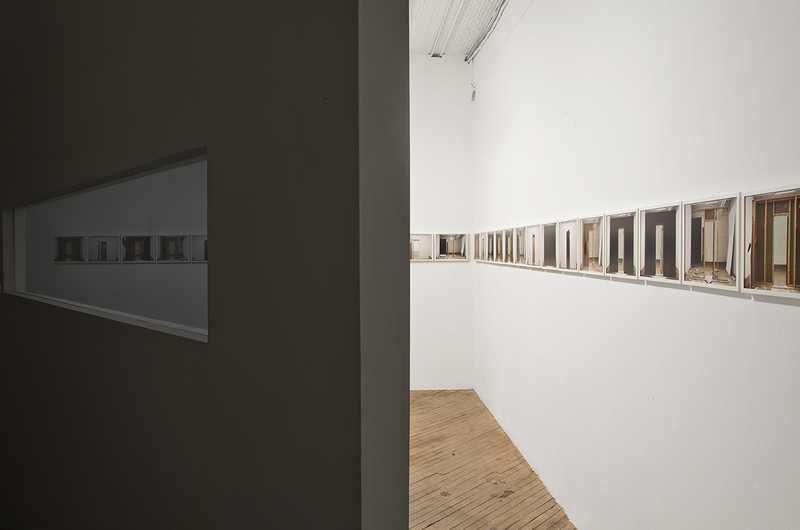 Bursese’s to skip, to gloss is a sleek and formal installation, a departure from much of the disassembled, floor-bound work that Vox Populi often exhibits. The efficient design of the exhibit allows for the discovery of a complex set of observations about perception and the process of self-examination. The viewer finds herself in familiar emotional spaces – as observer and performer – made more uncomfortable because both exist at once. There is a repetition of pairings found as one moves through the installation: couplings of objects and spaces that speak to each other. 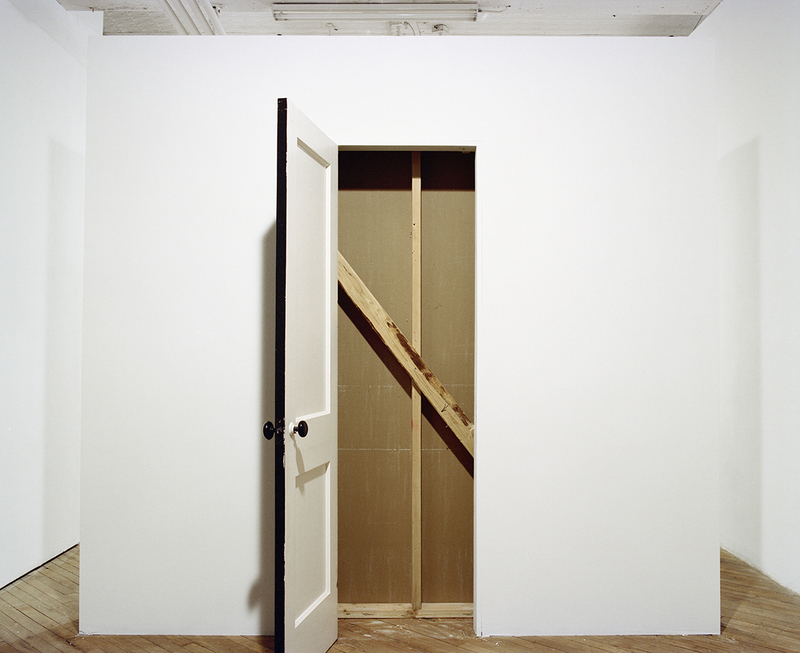 A diagonal wall in which a narrow, one-way mirror is installed creates two separate entrances, forcing the viewer to make a decision immediately upon entering the exhibition. 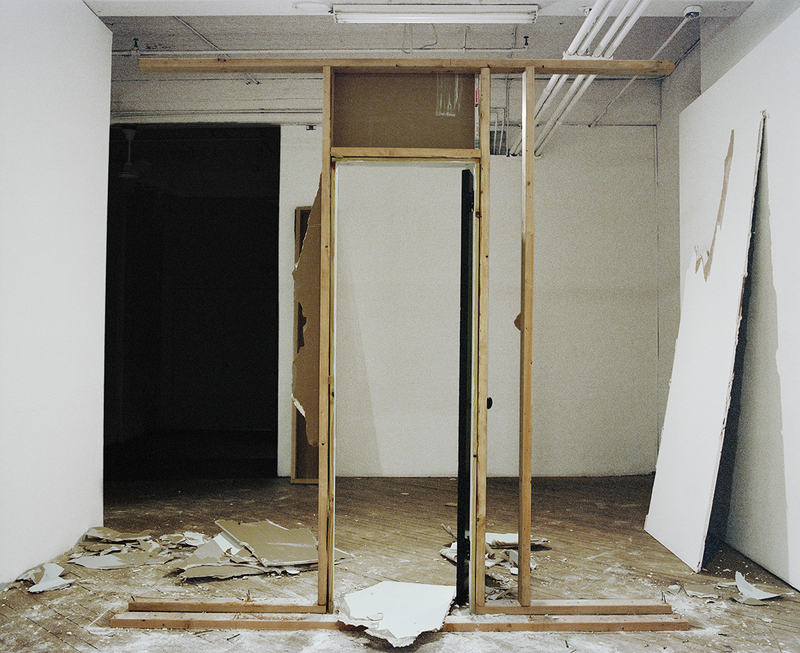 On one side, she is confronted with a brightly lit gallery space with a line of photographs of a wall and doorway in various stages of construction and demolition. The mirror reflects these framed pieces and the viewer. 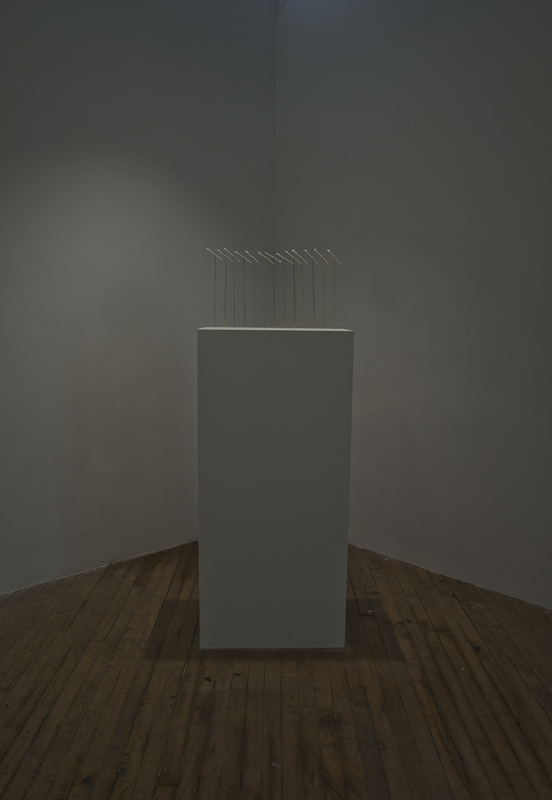 The other side is dimly lit, and a row of halved Q-Tips held by thin metal stands are fixed on top of a pedestal. Where First Friday crowds normally hamper the experience of viewing work, in this installation they are almost necessary. It is a disconcertingly voyeuristic experience to stand in the dark space near the cotton swabs – objects that are particularly personal and of the body – and observe the other visitors through the glass, most of whom are oblivious to the fact that other people can see them picking food out of their teeth. Through this experience, the viewer becomes more aware of their own actions, as well as their role in evaluating and affecting the actions of others. Similar to Bursese’s installation, Belknap’s sinister and humorous exhibition, Chum, demands that the observer become participant. 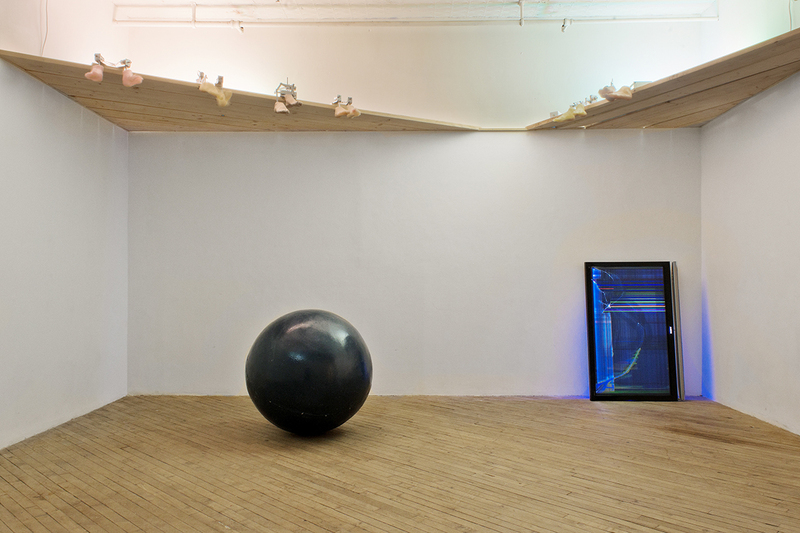 The first objects that the viewer notices in the space are high above them: seven pairs of fleshy silicone feet dangle from wooden platforms that circumscribe three walls of the room a few feet below the ceiling. Accompanied by the noise of their motors, the feet kick back and forth, slap and rub together, or twitch slightly. Looking up, one is reminded of being on the bottom of a body of water, immediately forcing them into a physically vulnerable space. While attending to this sight, the observer may not notice that the large, dark-colored orb that seems to have been sitting inanimate on the floor has begun to roll toward them in spurts. The ball appears to have a life of its own and seems to follow anyone who is tarrying nearby. 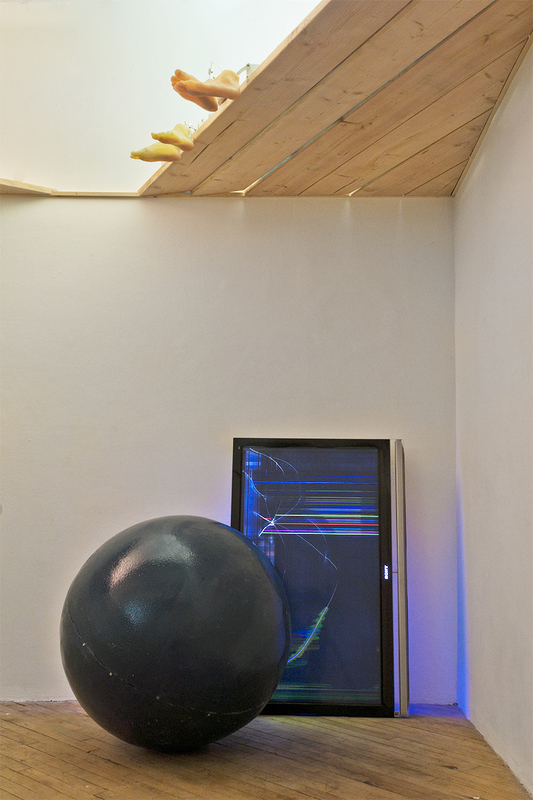 Every so often, the sphere finds its way to one corner of the room to bump against a large shattered television, modifying the illuminated patterns on the broken screen. Adding another ominous note to the exhibit, two bollards stand at the entrance in order to keep the ball from escaping. 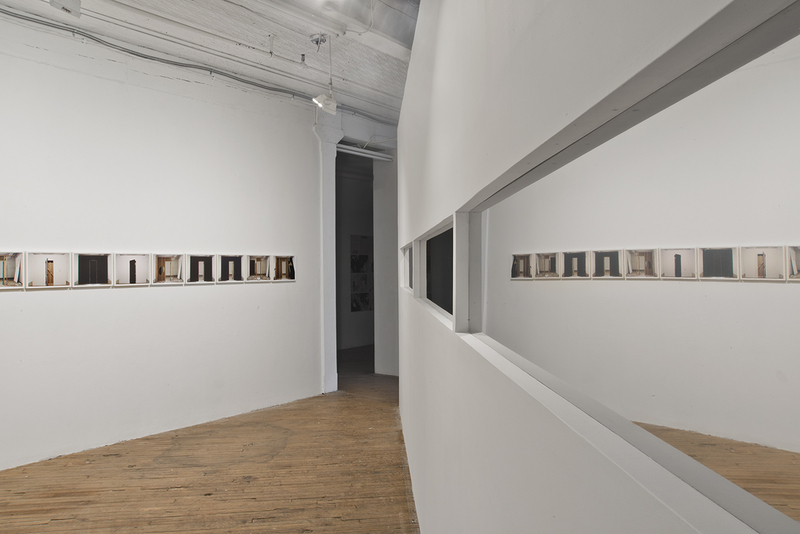 In a way that corresponds to Bursese’s work, Belknap challenges the viewer to consider how two disparate ideas relate. The animal-like lurching of the sphere and uncannily human movements of the feet are negated by the realization that these motions have been created mechanically. At the same time, the meaning of each object would change without its counterpart – the feet becoming lifeless, the motor having nothing to move. The artist creates tangibility as the viewer relates to the familiar movements of each object, and in the same instant has made them lifeless through exposing their automated nature. This dichotomy allows one to become more aware of the movements of their own body — to consider their own developed habits, automatic reactions and routines. These two artists have cleverly and humorously illustrated the complexity of these ideas and the struggle of becoming self-aware. 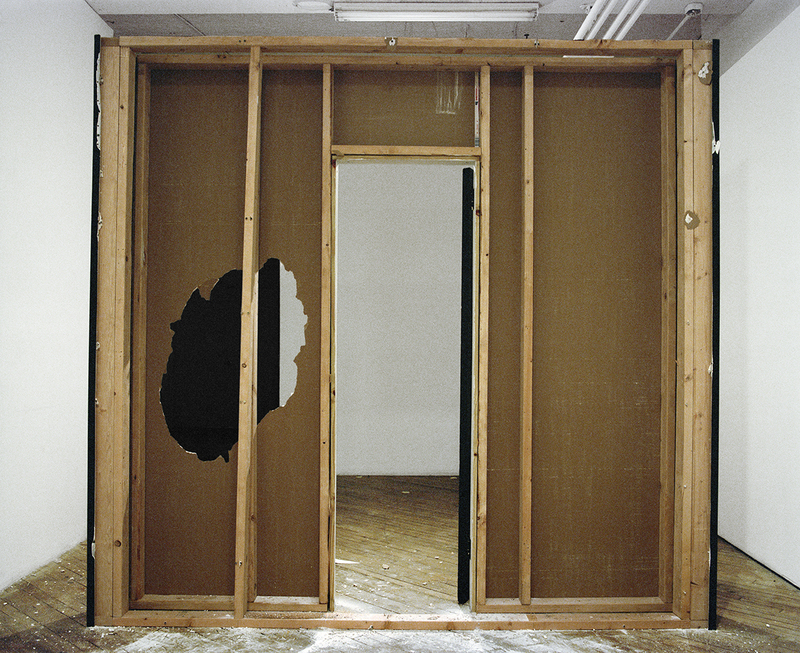 The viewer finds herself interacting with the exhibitions internally, delving deep into her own psychological responses and those of others around her. They encourage the viewer to question impulses and re-evaluate expectations or assumptions — practices that are more important now than ever. As Americans, we struggle to situate ourselves within an atmosphere that is fraught with non-truths and emotional manipulation, and our sense of perspective is invaluable. This objectivity must not only include the ability to see from someone else’s point of view, but also to know ourselves on a deeper level through this viewpoint. We must examine what drives our beliefs and actions. Are our opinions our own, or are we allowing the mechanisms of media, social bubbles, and misinformation to influence us? By prompting self-reflection on these and other themes in the viewer, these artists urge each visitor to come to their own conclusion.